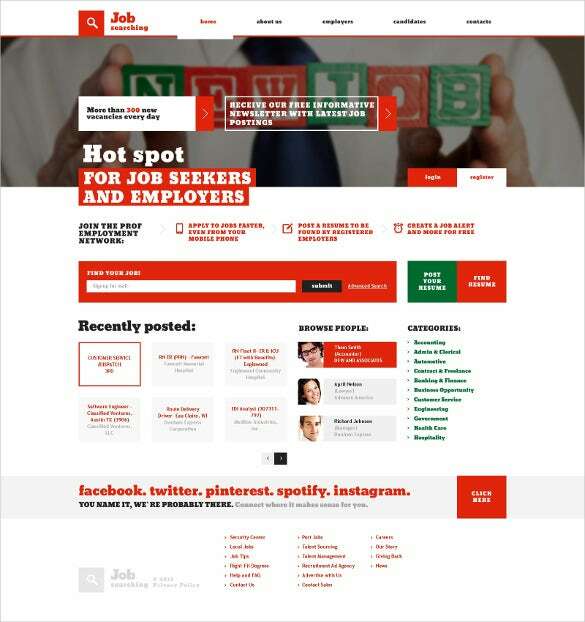 Job portal is a meeting point for employers and prospective employees. 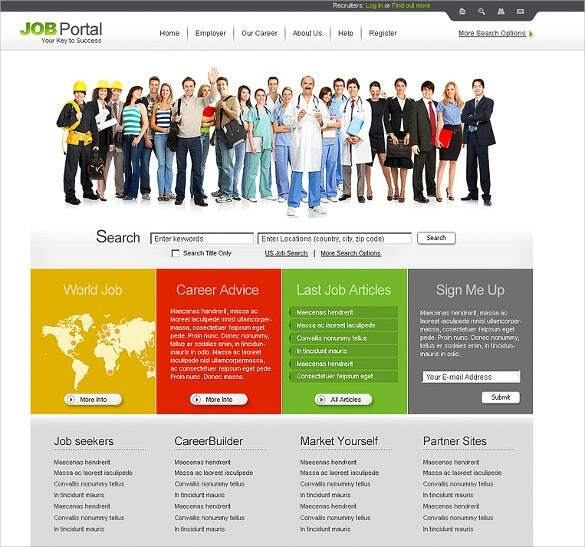 Job portal HTML5 templates contain all the latest components and features. These are the best from the world of jQuery and HTML5 templates. Employers can go through candidates profile and prospective employees can look for job openings. You May also visit HTML5 Themes & Templates. 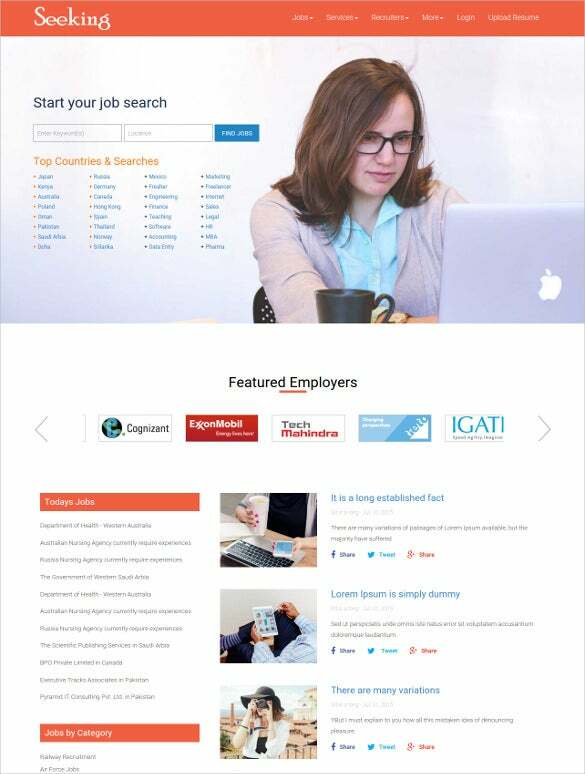 Contact form, captcha image verification and user login are the features available in Latest job portal templates free download. 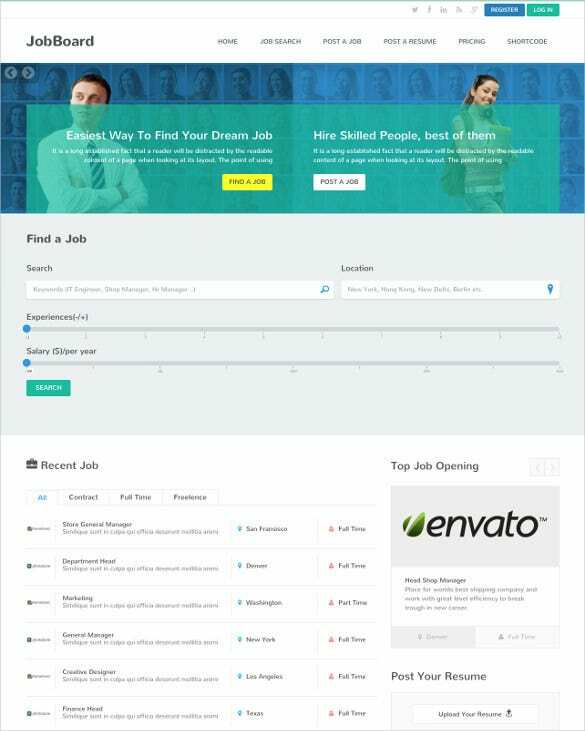 SEO friendly nature and cross browser compatibility along with subject specific features are also available in sample premium job site templates.Menus can be created, edited and removed. 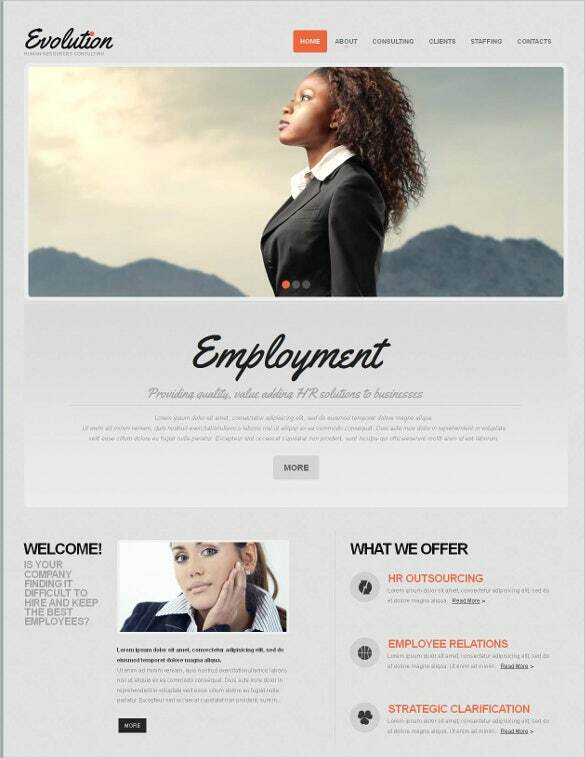 Menu for latest job, featured employers and job by category can be created. Youy may also visit jQuery HTML5 Website Themes. The Professional Job Portal Drupal HTML5 Template is very suitable for job boards of the various offices and firms. The template is packed with features like slider and grid view, organized and separated panels, and also allows the main menu to stay at the top to benefit navigation.You may also see event HTML5 themes & templates. 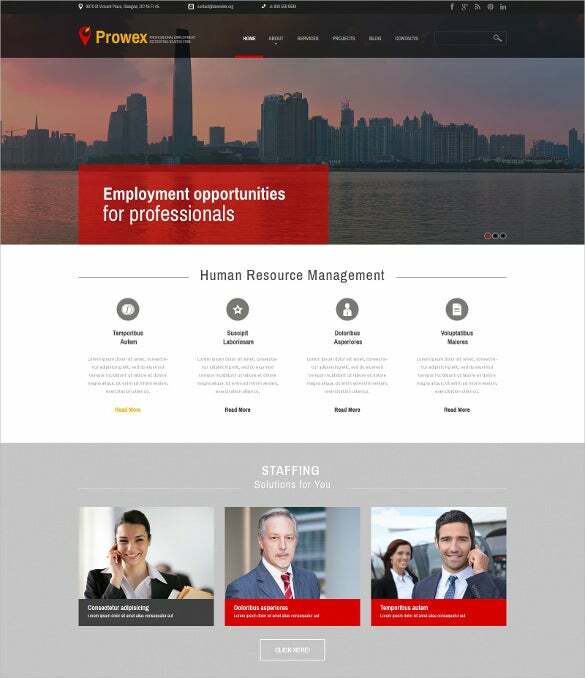 Along with amazing designs and multiple column layouts, the Employee Job Portal Joomla HTML5 Template is very useful for showcasing bulletins of the several offices in order to help the job applicants. The template comes with features such as crossbrowser compatibility, Google Accordion, Sliding Gallery, slider PSD and Google Fonts. 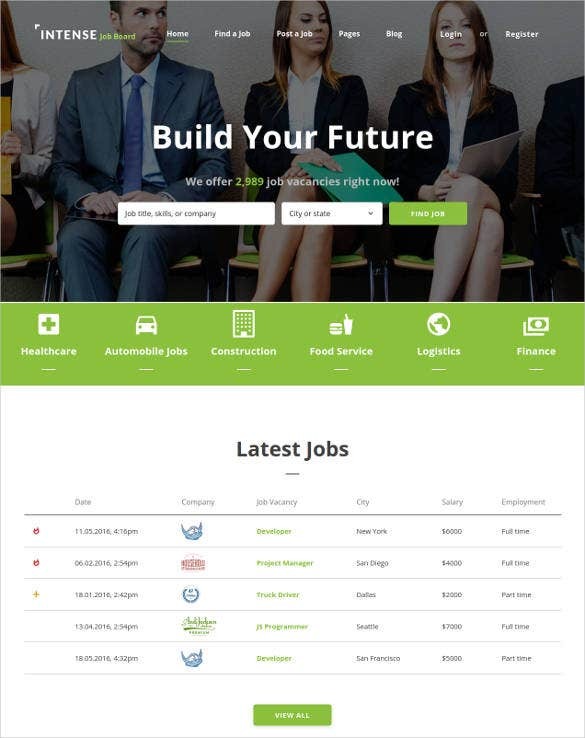 The Online Job Portal HTML5 Website Template is easy to install and is loaded with tons of features such as social options, live chat facility which makes it all the more easier for users to acquire information regarding job interviews and vacancies. This portal template also offers consultancy facilities for more assistance. You may also see high quality responsive HTML5/CSS3 website templates. This semantic and SEO friendly markup takes keywords for job, location, experience and salary expected per year into consideration. While being so specific, is optimized for mobile devices as well. You may also see best classified HTML5 website themes & templates. 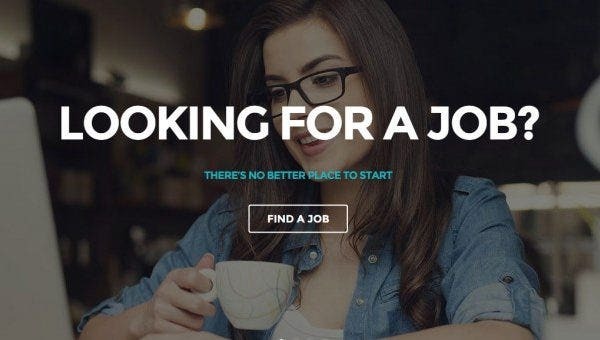 This template, Full Responsive with HTML5 Slider, has options for filling in your resume and job description, location, and type like freelancer, full timer, part-timer and intern. 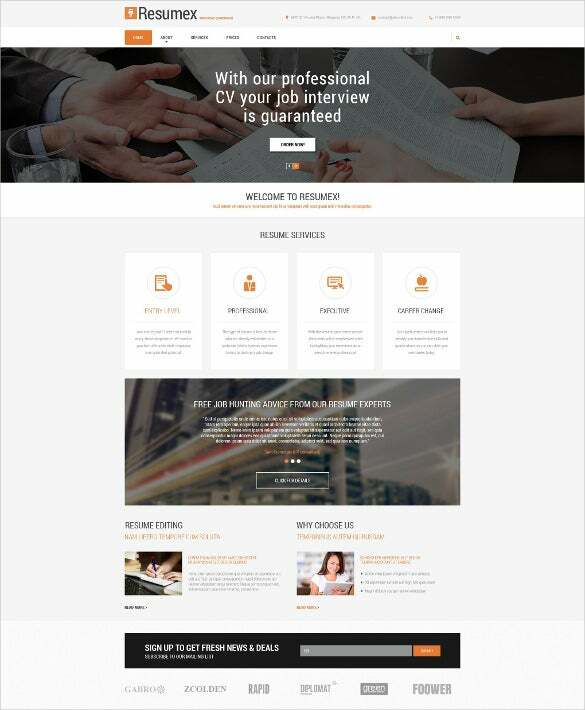 The Job Portal Moto CMS HTML Template is a theme which is very essential for the commercial and corporate firms who are seeking employers. 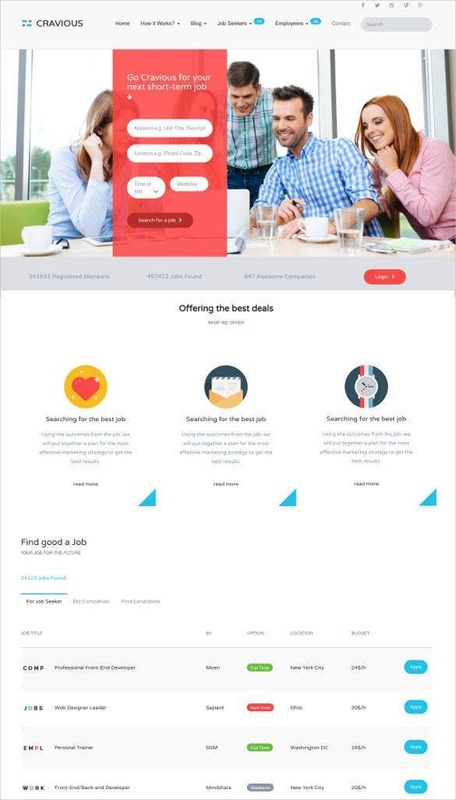 This responsive job portal template download is packed with several features like Tag Cloud, Cloud Zoom, and Google Web Fonts and has multiple design sets to choose from. The full screen slit slider for responsive design has multiple homepage styles that are very responsive. With bootstrap based designs this is easy to download and install.. 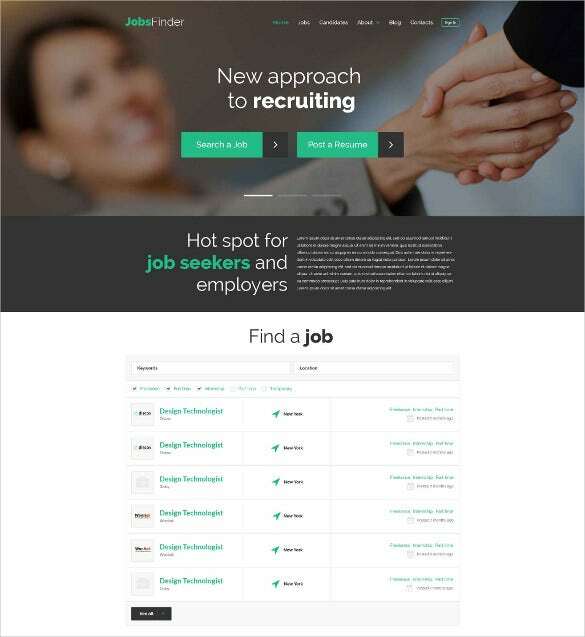 This job portal template has a 100% responsive theme based on bootstrap designs. It is built with user friendly interface for easy access via mobile devices. The Advanced Forms with Retina Display Ready is a very useful tool for firms to quickly update their employment status online. 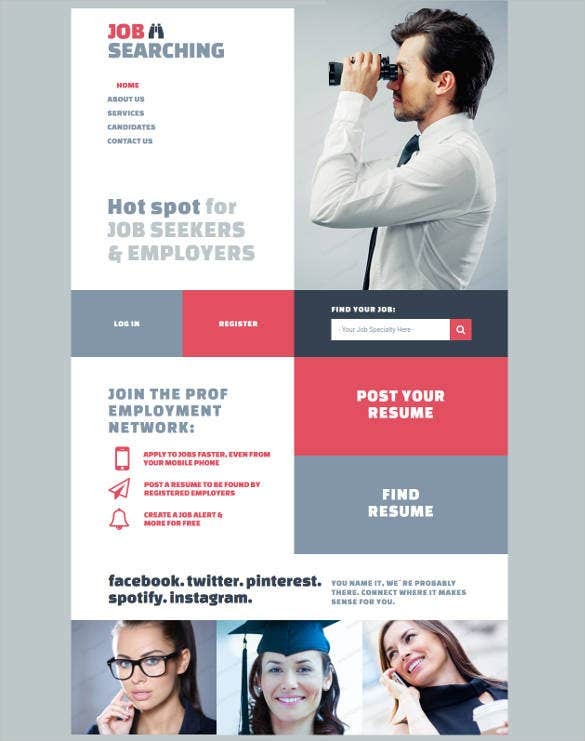 The job portal free download has options to edit the background image, color, designs, layouts and font styles with numerous verities available for the users to choose from. The Flexibe & Minimal Responsive Template is packed with several useful tools that make it user-friendly. This easy to install template comes with crossbrowser compatibility which helps users to get this template from any platform of any version such as Chrome, Opera, Firefox, Internet Explorer and so on. 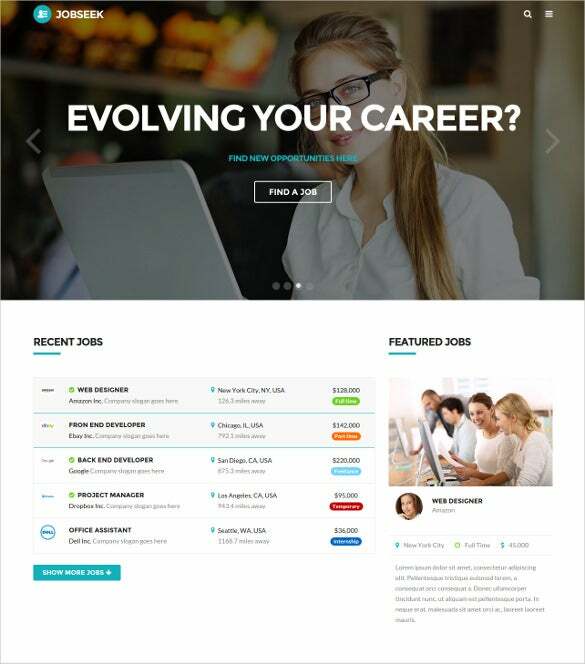 Use this PHP job portal template to create a career website. Features include job posting section, user profiles, and contact options. It is best for small-scale job listing websites, although it is easy to expand in future. 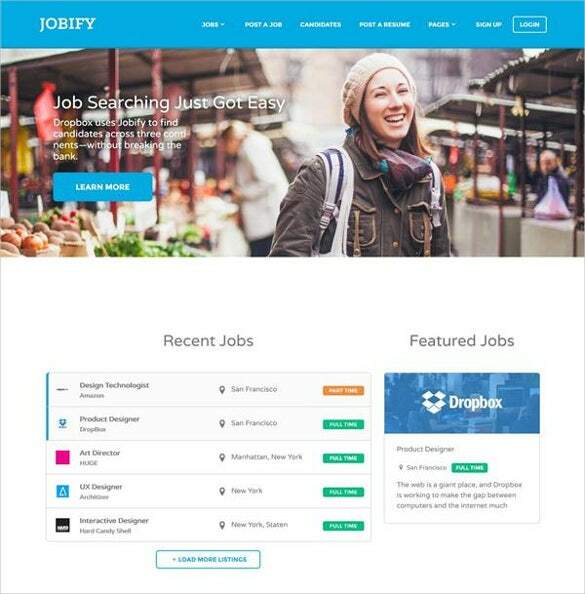 Use this template to create a job search portal for job seekers. It is a high quality template styled for you with the latest version of CSS 3 and HTML5. It is 100% responsive. 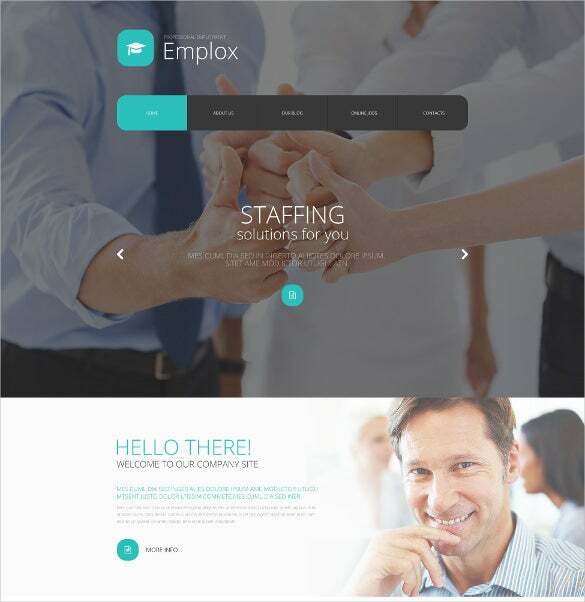 The Job Portal Bootstrap Responsive Web HTML5 Template is loaded with numerous features enabling the offices to upload their portal information. The Bootstrap framework helps the website to develop faster and a lot easier. Being responsive, the users can access this template from gadgets of any kind and size. Are you interested in creating a website around a blogger or staff theme? If yes, this is the best sample template that you can download and use for the job. Get your free download today. A portal should not be too difficult to design these days. And in the age where WordPress takes care of the coding needs on your behalf, all you have to do is to look for a high quality theme and use it to design your website in less than 45 minutes. The basic aim of free portal template is to offer important information regarding jobs, vacancies and so on to the aspiring applicants. 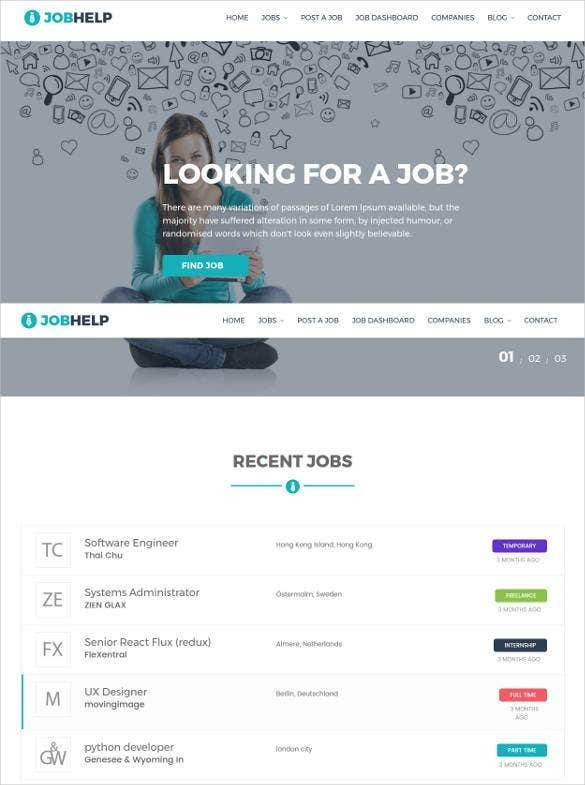 In order provide this information in a well-organized manner, a well-designed layout is very essential and that is the reason these job portal templates in bootstrap are so popular these days. 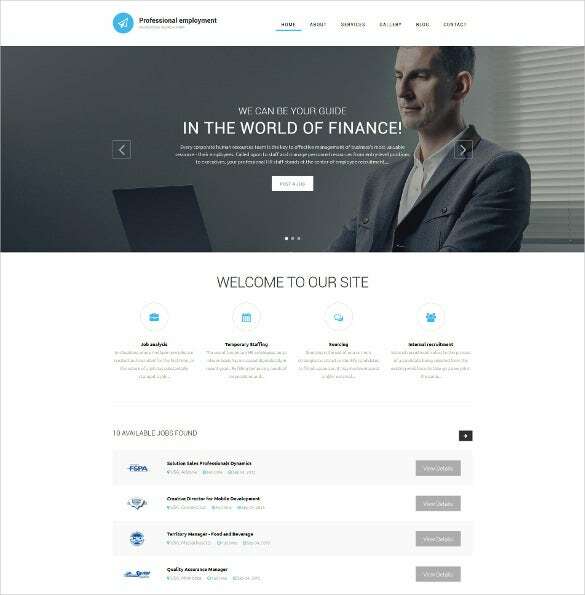 You can see also creative html themes & templates. 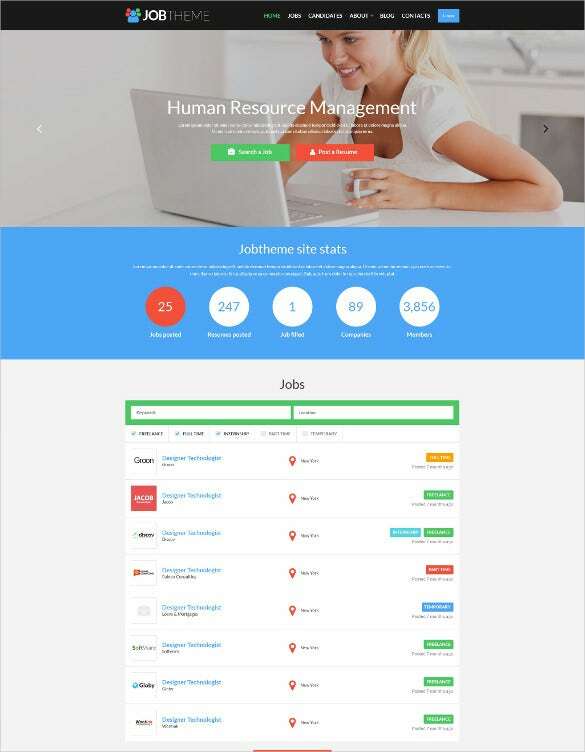 These readymade bootstrap job portal templates are loaded with several features making them useful to the job providers and job website agencies. One of the most important advantages of these job portal templates is to keep the users upgraded with constant flow of information.